Welcome to Part Two of our TCFD thought leader blog. Today’s Sustainability professionals are asked to do more with less. Their mandate is to cut expenses and eliminate resources, yet still deliver high-quality products that achieve big returns. In Part One, we explored and explained the recommendations from the Task Force on Climate-related Financial Disclosures (TCFD). In this second, concluding post, we’ll clarify the TCFD recommendations, and tell you how you can cope with the new requirements in a way that’s financially-accurate and sustainable, and effectively delivers data that can be signed off by the CFO with confidence. Strategy – describe the climate-related risks and opportunities and their impacts on the organization; describe the impacts of some scientific scenario on the organization. This includes climate-related scenario analysis, i.e. a 2°C or lower scenario. Risk Management – disclose the processes your organisation has in place to identify, assess and manages those climate related risks and opportunities and how they are integrated into the overall risk management of the organization. Sector specific supplemental guidance is aimed at helping financial industries and the four largest emitting sectors (Energy, Transport, Materials & Buildings, and Agriculture, Forests & Food) manage their disclosure. The TCFD recommendations allow for considerable flexibility on interpretation and implementation. For instance the definition of short, medium and long term time frames with regards climate change risks and opportunities can be established to fit your investment or development cycle and other factors. In determining the most relevant and useful metrics, organizations are encouraged to engage with their key stakeholders, including investors, and review publicly available frameworks. If you already disclose to the CDP they may also be considered as a stakeholder in this process. In addition the TCFD recommends regular review to continually examine the availability of new information, for example emerging climate science or evolving legislative challenges. Again it’s up to your business to establish an appropriate frequency of review. The same is true of how material Climate Change issues are. This may not be a simple question to answer given the reach of the business’ activities, consideration of the effect of Climate Change in the value chain and potentially long term thinking required. It’s up to your organisation to establish how best to interpret the recommendations – although there are concerns over some of the details – for instance CDP have been advocating for the more widespread use of policy such as the UK’s Mandatory Carbon Reporting legislation. What’s next for your organization, and how will you cope? Because these disclosures should be included in mainstream financial filings, the governance processes should be similar to those used for existing public financial disclosures and would likely involve review by the CFO and audit committee, as appropriate. 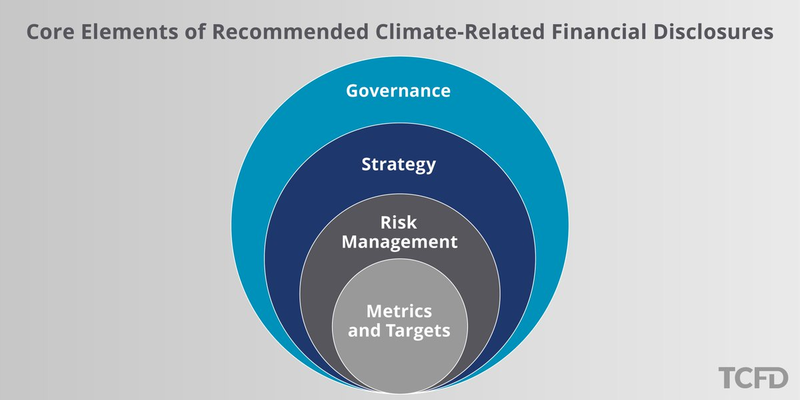 Organizations that provide climate-related financial disclosures in reports other than financial filings should follow internal governance processes that are the same or similar to those used for financial reporting. Since 2010, CFOs in the United States must personally sign off on the controls and procedures that are in place to report material climate change-related risks. Under these regulatory requirements, all CFOs need to ensure their companies’ processes are high quality: climate change-related data must be quality assured, and provenance verified as both reliable and pertinent. This can be problematic to sustainability teams as many do not receive accurate data and data verification is time consuming and sometimes seems impossible without outside help, which can be very expensive. Since 2013 listed businesses in the UK have been required to include carbon emissions data alongside financial data in the company annual report. This can be problematic to sustainability teams as many do not receive accurate data and data verification is time consuming and sometimes seems impossible without outside help, which can be very expensive. The Ecometrica Platform is the only platform on the market that can deliver data accuracy that is consistent with financial data, that can be signed off by CFO and presented with confidence in SEC report. We do this through our Audit Ready output, the only GHG accounting Platform to have PwC assurance. Significantly reduce your time collecting, verifying and calculating data. Ecometrica’s Sustainability Reporting Platform gives sustainability professionals their time back to efficiently and accurately share its vision for the future with management and your stakeholders. As CDP’s only gold software partner for Forests, Water and Climate Change, Ecometrica allows teams to deliver clear, trustworthy reports in a timely manner, with the best possible scores. Ecometrica’s award winning Mapping tools assist with identifying risks for climate change, water and deforestation for direct operations and throughout the value chain. It is likely that your existing Governance, Strategy and Risk Management practices and personnel will already be capable of delivery the detailed analysis required to meet the terms of the TCFD. However these teams are likely to need engaging with, educating and supporting in order to include Climate Change on a more equal footing with the range of more traditional factors used for planning and strategy. The TCFD guidelines does not have to be yet another task on your plate. Ecometrica has empowered hundreds of organizations by enabling their non-financial reporting teams to more effectively collect, manage, and report on data, allowing teams to focus on what is meaningful to the company and tell their story. To learn more about how Ecometrica can help you streamline your Sustainability reporting process, and assist with the TCFD guidelines visit https://ecometrica.com/platform/request-a-demo to schedule a demo.